Edward Hand was an American military and political leader in the American Revolution and the early years of the new nation. He was born in Ireland on December 31, 1744. He became a doctor before being sent to Philadelphia, Pennsylvania in 1767 by the British army. He served in the British army until 1774, when he resigned to become a doctor in Lancaster, Pennsylvania. In 1775, he enlisted in the Continental Army and assisted the Americans during the American Revolution. He was present at the struggle for Boston in 1775 and also for New York in 1776. He also fought against the British at Trenton and Princeton. In 1777 he was promoted to the rank of brigadier-general and became the commander of Fort Pitt (modern day Pittsburgh, Pennsylvania). At Fort Pitt, Hand was to deal with the British soldiers and American Indians occupying the Ohio Country. Hand hoped to sway those American Indian nations that were neutral in the conflict or loyal to the British to come over to the American side. This became an almost impossible task after the murder of Cornstalk, a prominent Shawnee leader, in September 1777. Cornstalk had visited Fort Randolph in what is now West Virginia to warn the Americans that the Shawnee were planning an attack. Militiamen blamed Cornstalk for several recent attacks on Anglo-American settlers in the area and killed him. In 1778, Hand sought revenge on Ohio's Seneca-Cayuga people for their alliance with the British. 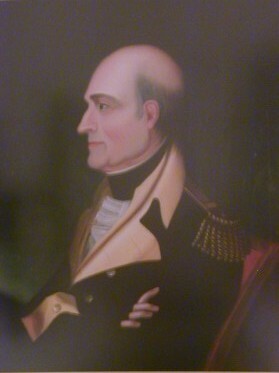 He led five hundred militiamen to the Mahoning River. Simon Girty participated in the campaign as both a guide and interpreter for the Americans. Hand's men failed to locate any Seneca-Cayuga. Seeing that his men were hungry, tired, and cold, Hand ordered return to Fort Pitt. On the way back, they came across a small Lenape (Delaware) village. Among the Lenape were family members of Captain Pipe. Even though the Lenape were currently at peace with the Americans, the militiamen attacked. The soldiers killed two Lenape, including Captain Pipe's brother. Most of the Lenape escaped death because they informed Hand of a nearby Munsee village. Hand sent a small detachment to capture the Munsee. The soldiers found only four women and a young boy. The militiamen killed all of the captives except for one woman. Hand disapproved of the murders, since they were of non-combatants; but he did not stop them. His men returned to Fort Pitt. This campaign against the Seneca-Cayuga became known as the "Squaw Campaign," because most of the American Indians that the Americans killed and captured were women. In 1778, Hand transferred to New York. He remained in the Continental Army until the war's conclusion in 1783 and rose to the rank of major general. Following the war he returned to his medical practice. He was elected to the Confederation Congress in 1784 and served two years. Hand was an assemblyman in the Pennsylvania legislature from 1785 to 1786 and served in the Pennsylvania convention that ratified the United States Constitution. He was a member of the Federalist Party and strongly opposed Thomas Jefferson in the election in 1800. Edward Hand died on September 3, 1802.